Have you ever gone to the grocery store and saw one of those gorgeous fruit trays? You can make a fruit tray in your home that is every bit as delicious-looking and -tasting as those you can buy. By making it yourself, you can add the fruits you love. All you have to do is buy the fruit and aluminum tray, or use a large plate from your kitchen. It's simple, fast and your whole family will love it. Rinse off the fruit with some water and set it on paper towels. Gently pat dry. Always wash off all of your fruit to make sure there are no pesticides left on the outside. Get the fruit dip. You can make your own by mixing 8 oz. cream cheese, 1 cup of Cool Whip and 1/4 cup of sugar--or you can just go the grocery store and buy some commercial fruit or caramel dip. Peel and cut the fruit. Don't peel the red and green apples. Peel and cut the cantaloupe into 3- or 4-inch chunks. Cut the apples and the chunks of cantaloupe into slices. Cut the fruit as thick or thin as you want. You can leave the tops on the strawberries when you slice them in half if you wish, for added visual appeal. Arrange the fruit on the tray. Place a layer of cantaloupe on the tray and then a smaller layer of apple slices on top, alternating between the red and green apples. Coordinate the colors of the fruit when you arrange them so they are pleasing to the eye. Place the grapes in the middle of the tray and make a slight well in the middle of the grapes. Place the cherries in the well. Arrange the strawberries so they are encircling the grapes. Either place a container of toothpicks near the fruit tray or use forks and spoons to get the fruit to your plate. An interesting twist on a fruit platter is to scoop out the inside of a pineapple, watermelon or cantaloupe and arrange your fruits inside. Try using a melon baller instead of just cutting the cantaloupe up into slices, for a different look. You don't have to layer the fruit. 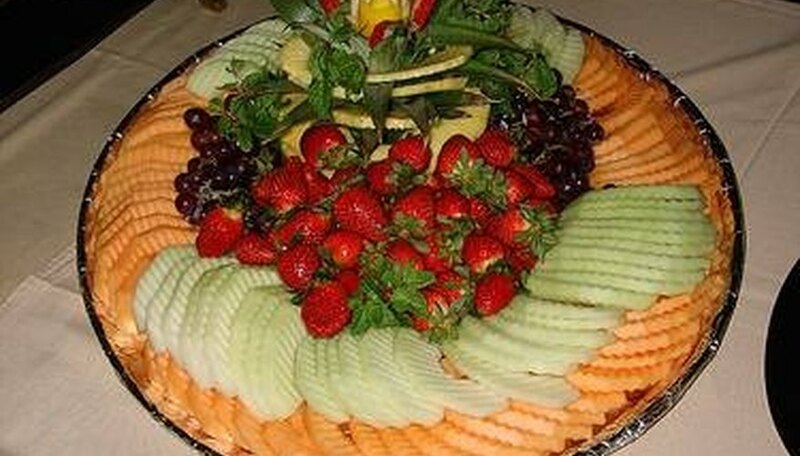 You can also section each of the fruits on the platter. Make sure the tray or plate you put the fruit on has a raised lip, so the juices don't get all over the place.